For the set of rules that govern structure or behavior of people, see Social system. In the 19th century the French physicist Nicolas Léonard Sadi Carnot, who studied thermodynamics, pioneered the development of the concept of a "system" in the natural sciences. In 1824 he studied the system which he called the working substance (typically a body of water vapor) in steam engines, in regards to the system's ability to do work when heat is applied to it. The working substance could be put in contact with either a boiler, a cold reservoir (a stream of cold water), or a piston (on which the working body could do work by pushing on it). In 1850, the German physicist Rudolf Clausius generalized this picture to include the concept of the surroundings and began to use the term "working body" when referring to the system. In the 1980s John Henry Holland (1929–2015), Murray Gell-Mann (1929–) and others coined the term "complex adaptive system" at the interdisciplinary Santa Fe Institute. There are natural and human-made (designed) systems. Natural systems may not have an apparent objective but their behavior can be interpreted[by whom?] as purposeful by an observer. Human-made systems are made with variable purposes that are achieved by some action performed by or with the system. The parts of a system must be related; they must be "designed to work as a coherent entity" — otherwise they would be two or more distinct systems. A subsystem is a set of elements, which is a system itself, and a component of a larger system. The IBM Mainframe Job Entry Subsystem family (JES1, JES2, JES3, and their HASP/ASP predecessors) are examples. The main elements they have in common are the components that handle input, scheduling, spooling and output; they also have the ability to interact with local and remote operators. 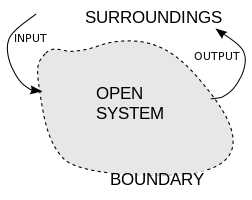 A subsystem description is a system object that contains information defining the characteristics of an operating environment controlled by the system. The Data tests are performed to verify the correctness of the individual subsystem configuration data (e.g. MA Length, Static Speed Profile, …) and they are related to a single subsystem in order to test its Specific Application (SA). System can also refer to a framework, aka platform, be it software or hardware, designed to allow software programs to run. A flaw in a component or system that can cause the component or system to fail to perform its required function, e.g., an incorrect statement or data definition. A defect, if encountered during execution, may cause a failure of the component or system. In engineering and physics, a physical system is the portion of the universe that is being studied (of which a thermodynamic system is one major example). Engineering also has the concept of a system referring to all of the parts and interactions between parts of a complex project. Systems engineering is the branch of engineering that studies how this type of system should be planned, designed, implemented, built, and maintained. Expected result is the behavior predicted by the specification, or another source, of the component or system under specified conditions. ^ "Definition of system". Merriam-Webster. Springfield, MA, USA. Retrieved 2019-01-13. ^ "σύστημα", Henry George Liddell, Robert Scott, A Greek–English Lexicon, on Perseus Digits Library. ^ Marshall McLuhan in: McLuhan: Hot & Cool. Ed. by Gerald Emanuel Stearn. A Signet Book published by The New American Library, New York, 1967, p. 288. ^ 1945, Zu einer allgemeinen Systemlehre, Blätter für deutsche Philosophie, 3/4. (Extract in: Biologia Generalis, 19 (1949), 139–164. ^ 1948, Cybernetics: Or the Control and Communication in the Animal and the Machine. Paris, France: Librairie Hermann & Cie, and Cambridge, MA: MIT Press.Cambridge, MA: MIT Press. ^ 1956. An Introduction to Cybernetics, Chapman & Hall. ^ European Committee for Electrotechnical Standardization (CENELEC) - EN 50128. Brussels, Belgium: CENELEC. 2011. pp. Table A.11 – Data Préparation Techniques (8.4). ^ Steiss, 1967, pp. 8–18. ^ Checkland, 1997; Flood, 1999. ^ a b "ISTQB Standard glossary of terms used in Software Testing". Retrieved 15 March 2019. ^ Warden, John A. III (1988). The Air Campaign: Planning for Combat. Washington, D.C.: National Defense University Press. ISBN 978-1-58348-100-4. ^ Warden, John A. III (September 1995). "Chapter 4: Air theory for the 21st century". Battlefield of the Future: 21st Century Warfare Issues (in Air and Space Power Journal). United States Air Force. Retrieved December 26, 2008. ^ Warden, John A. III (1995). "Enemy as a System". Airpower Journal. Spring (9): 40–55. Retrieved 2009-03-25. ^ Russell, Leland A.; Warden, John A. (2001). Winning in FastTime: Harness the Competitive Advantage of Prometheus in Business and in Life. Newport Beach, CA: GEO Group Press. ISBN 0-9712697-1-8.